The Thomson River Diversion Tunnel Site including the 220 metre tunnel through Stockriders Spur, the 1.2km section of river bed known as Horseshoe Bend between the tunnel's inlet and outlet, the inlet and outlet pools, and the river banks extending 20 metres either side of the Horseshoe Bend river bed. 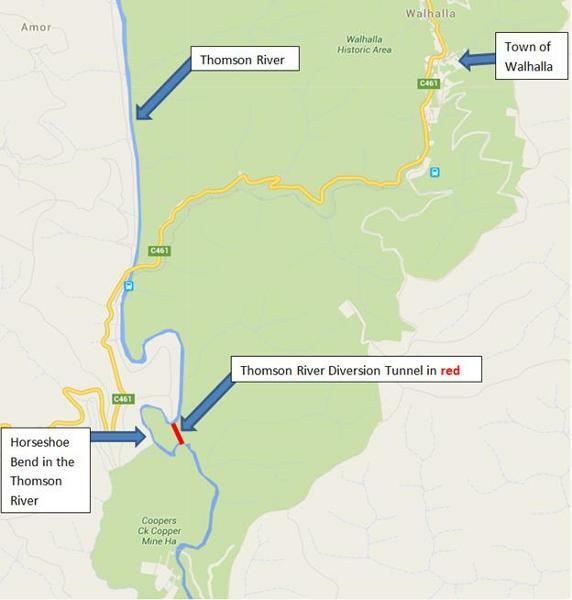 The Thomson River Diversion Tunnel Site is located near the Gippsland gold township of Walhalla. Gold was discovered in the Thomson River valley in late 1862 and a rush to the region began. Alluvial gold mining was carried out along the Thomson River for several decades from the 1860s, although quartz reef mining became the region's predominant mining industry. The Thomson River Diversion Tunnel was constructed by the Thomson River Alluvial Gold and Tailings Recovery Company between August 1911 and about October 1912. The tunnel was blasted through a slate ridge called Stockriders Spur. The purpose of the Tunnel was to divert a portion of river flows away from a 1.2 km section of the natural river bed on either side of the tunnel known as Horseshoe Bend. The decreased flow of water around Horseshoe Bend enabled the sluicing of the gravel deposits in the river bed. From the 1850s diversion tunnels, cuttings and embankments facilitated mining along rivers and creeks in a number of Victorian goldfields in mountainous regions. Diversion mining was not common and only carried out where the natural topography was suitable. 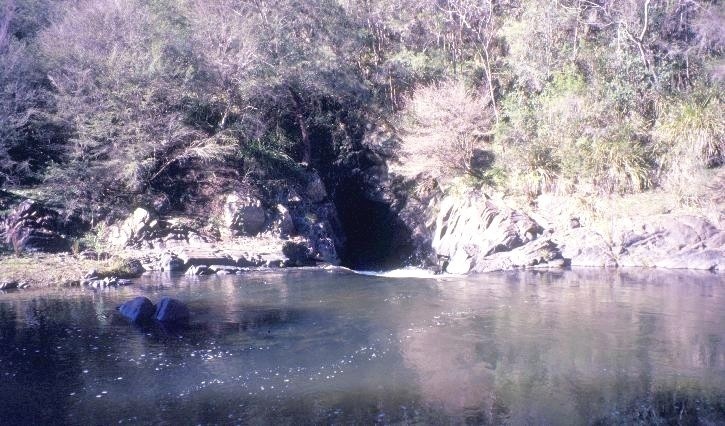 The construction of the Thomson River Diversion Tunnel was an ambitious gamble and came at a time when Walhalla's quartz mining industry was ending. The mining lease at Horseshoe Bend was declared void on 10 March 1914. Over time flooding and erosion have removed all traces of mining activity in the Horseshoe Bend river bed. The diversion tunnel is the last and longest of the thirteen river diversions tunnels surviving from the Victorian gold rush period. 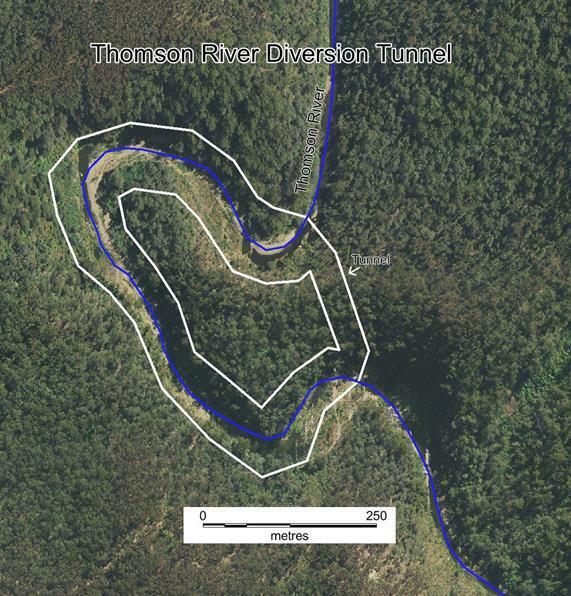 The Thomson River Diversion Tunnel Site is located about 4km south-west of Walhalla in Gippsland 1.5km south of where Stringers Creek joins the Thomson River. The tunnel has been excavated under Stockriders Spur and is 220 metres in length. The Thomson River flows to the south and the tunnel extends on a downwards incline between the inlet and outlet and has a sharp change in horizontal angle prior to both inlet and outlet. The tunnel diverts a portion of river flows away from a 1.2km section of the river bed between the inlet and outlet, which is known as Horseshoe Bend. There are deep pools of water in the river near the inlet and outlet. This site is part of the traditional land of the Gunaikurnai people. There is evidence of 1870s-80s ground sluicing in various places around Horseshoe Bend on spurs (slopes) above the river bed. 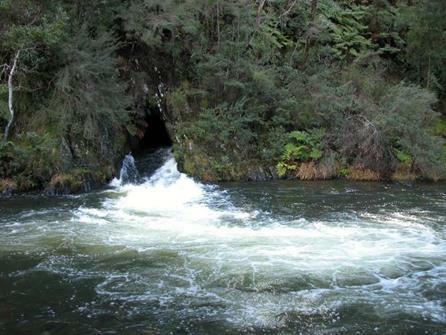 The Thomson River Diversion Tunnel Site is a place of co-existing natural and cultural heritage values. 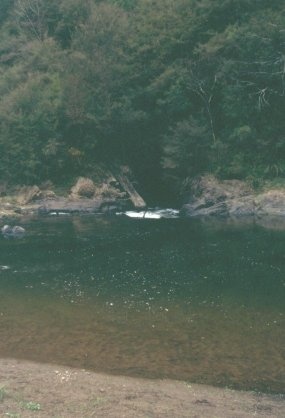 The Thomson River is listed as a Heritage River under Heritage Rivers Act 1992. All of the place shown hatched on Diagram 1990 encompassing part of Crown Allotment 3D, Section B, Parish of Moondarra, and parts of Crown Allotments 7 and 7A, Section C, Parish of Numbruk, being a 5-metre curtilage from the Thomson River Diversion Tunnel and a 20-metre (more or less) curtilage from each bank of the Thomson River between the tunnel adits. The Thomson River is one of the major waterways in the Walhalla Goldfield, a region known for quartz mining. This goldfield was one of a succession of gold discoveries in the late 1850s and early 1860s as prospectors worked further into the vast mountain ranges of eastern Victoria. The alluvial gold found in the bottom of the valley (at the site of current day Walhalla) by Ned Stringer in January 1863 derived from the erosion of gold-bearing quartz reefs on the hillsides above. With the example offered by so many earlier goldfields in Victoria, these reefs were opened rapidly. The best of the many reefs discovered at Walhalla, Cohen's Reef, achieved astonishing levels of production in the Long Tunnel and Long Tunnel Extended ground, the Long Tunnel going on to become the State's highest gold producer historically with 815,569 ounces of gold and paying £1,283,400 in dividends. The combined production from the Long Tunnel and Long Tunnel Extended was 1,255,881 ounces, with over £2 million paid in dividends. This level of success of Walhalla quartz reefs ensured ongoing interest in gold in the area, including the gold that had eroded naturally over time into stream systems like the Thomson River. In 1870 the Thomson River diggers struck a lead on the river, near the Thomson River Bridge. Payable results were obtained. In 1871 the Mining Surveyor reported that 'at Cooper's Creek a party are engaged in tunnelling in the bed rock, to form a tail-race for the purpose of draining the flat, which is supposed to be the old bed of the Thomson River'. By mid-1872 alluvial mining in the district was said to be confined to scattered miners, getting fair returns. In 1877, the bed and banks of the Thomson River were reported to be providing a fairly good living for the miners. The following year creek and river sluicing in the district increased and several parties on the Thomson River were making better than wages. The number of miners on the river increased again in 1879, some parties earning £4 per week per man. The Mining Surveyor reported in 1880 that 'alluvial mining consists wholly of creek and river mining'. Another report two years later painted a different picture, with the mining surveyor writing that 'alluvial mining seems to be gradually declining, if not dying out, in this division', and speculated further that 'considering that the beds and banks of the various rivers and creeks have generally been so often turned over, the wonder is that they continue at all remunerative'. In 1886 he wrote that 'alluvial mining 'in the true sense is completely at a standstill, a few creek and river sluicers being at present the only winners of free gold, and as nearly all the beds in this division (which, by-the-bye, were never rich) have at some time or other been passed through the sluice-box, not much can be expected from this source'. 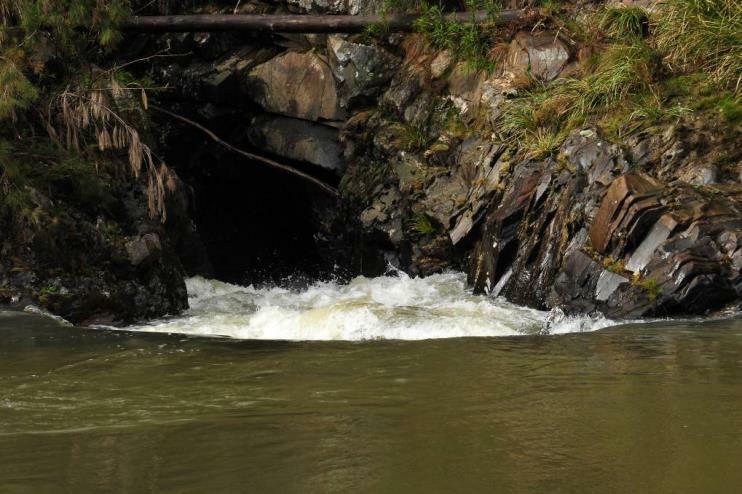 The Thomson River Diversion Tunnelseems to have had its origins in 1898, when George Weeks took up a narrow strip of the riverbed around Horseshoe Bend. Weeks' diversion scheme was nearly four and a half miles long and eleven yards in width, and included at least two flumes to transport the diverted flow across the Thomson River and a long tunnel through Horseshoe Bend. This grand scheme was never built. Between 1911 and 1912 the Thomson River Alluvial Gold and Tailings Recovery Company undertook more modest works at Horseshoe Bend to divert a portion of the river flows by driving a tunnel through Stockriders Spur. The purpose of diversion tunnels was to divert some of the river flow away from the river bed so that it could be sluiced for alluvial gold, particularly in summertime. Horseshoe Bend was an ideal site for a diversion tunnel because it possessed a topography and features worth the financial risk - a known gold location, a suitable size and shaped spur through which a tunnel would make a very long section of the river bed accessible, and the existence of a large rock bar to facilitate stream flow into a tunnel built upstream from it. The work at Horseshoe Bend commenced in 1911. Labour problems after the first 215 feet forced the company to tender out the completion of the tunnel, and the contract was awarded to William John (Jack) Hannaford. Jack pushed on, opening two faces, and leaving a small strip of rock at the inlet end. By 18 September 1912 the tunnel was 533 feet long and nearing completion, and in October the tunnel was finally opened with a gala day. The last charges were set on a thin wall of rock, but rather than wait for a signal from Jack, the miner who was to set the explosives off got impatient and lit the fuses. The wall was breached and water flooded through the tunnel. Unbeknown to him, Jack had let his wife and three oldest children have one last ride in the trolley, and they were swept from the tunnel in a torrent of water. Fortunately his wife Clara was a good swimmer and rescued all the children. 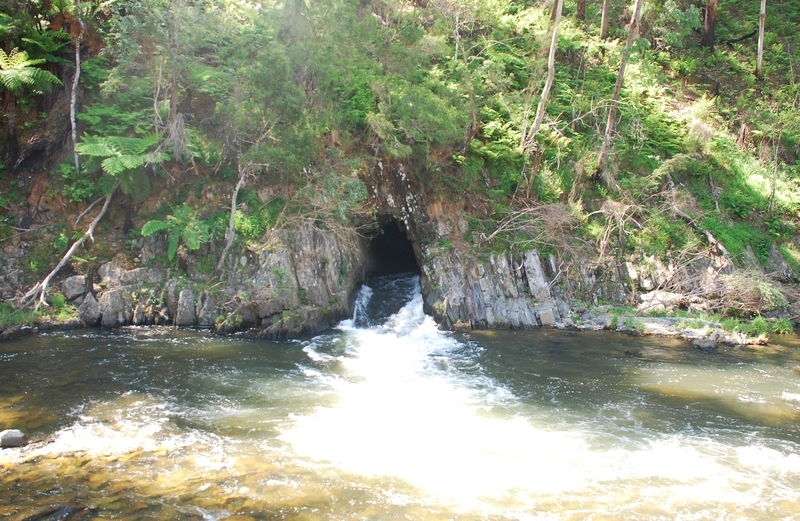 Once completed, a portion of the flows of the Thomson River flowed through the tunnel, allowing the river bed to be sluiced for alluvial gold. The results of the mining that followed are not known, and it has been assumed that because no reports followed, the operation was not very successful. The lease was declared void on 10 March 1914, less than 18 months later. It may be that that this was sufficient time to completely strip the river bed around the bend, after which time the company would have had no further interest in that section of creek. Gold mining across Victoria decreased dramatically with the advent of World War I (1914-18). The Thomson River Alluvial Gold and Tailings Recovery Company No Liability was struck off the companies register in 1943. Rob Kaufman, Historic Heritage Survey: Horseshoe Bend Gold Mining Area, Thomson River, Victoria, Report prepared for West Gippsland Catchment Management Authority, 5 October 2010. David Bannear, Victorian Goldfields Project: Assessment of Historic Gold Mining Sites, Reports produced by for the former Department of Conservation, Forests & Lands and Department of Natural Resources & Environment between 1990 and 1999. .Installation of any safety equipment or earthworks required for public safety or to leave sections in a safe condition. .Monitoring of structural integrity of tunnel. .Removal or lopping of trees and vegetation. .Works to or extension of existing tracks. .Undertaking of safety and access works to restrict foot traffic access. .Installation of information signage for interpretation and public risk purposes. .Minor waterway management activities, provided that there is no adverse impact on the cultural heritage significance of the place. .Fire suppression and fire-fighting duties provided the works do not involve the removal or destruction of any significant above-ground features or sub-surface archaeological artefacts or deposits. .Fire suppression activities such as fuel reduction burns, and fire control line construction, provided all significant historical and archaeological features are appropriately recognised and protected. Note: Fire management authorities should be aware of the location, extent and significance of historical places when developing fire suppression and fire-fighting strategies. The importance of places listed in the Heritage Register must be considered when strategies for fire suppression and management are being developed. .Weed and vermin control activities provided the works do not involve the removal or destruction of any significant above-ground features or sub-surface archaeological artefacts or deposits. .Removal of plants listed as noxious weeds in the Catchment and Land Protection Act 1994. Note: Particular care must be taken with weed and vermin control works where such activities may have a detrimental effect on the significant fabric of a place. Such works may include the removal of ivy, moss or lichen from an historic structure or feature. .Development including emergency stabilisation necessary to secure safety where a site feature has been irreparably damaged or destabilised and represents a safety risk to its users or the public. .Signage and site interpretation products must be able to be later removed without causing damage to heritage fabric. 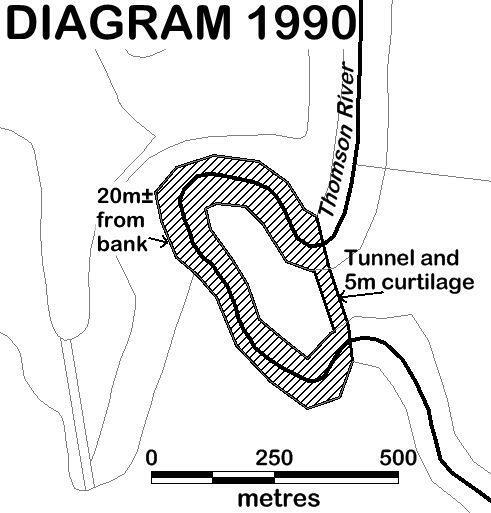 The extent of registration of the Thomson River Diversion Tunnel Site in the Victorian Heritage Register affects the whole place shown on Diagram 1990 including the land, tunnel and other features. Under the Heritage Act 1995 a person must not remove or demolish, damage or despoil, develop or alter or excavate, relocate or disturb the position of any part of a registered place or object without approval. It is acknowledged, however, that alterations and other works may be required to keep places and objects in good repair and adapt them for use into the future. It is recommended that a Conservation Management Plan (CMP) is developed to manage the place in a manner which respects its cultural heritage significance. The following documents may be useful in the management of the cultural heritage at this place. .Rob Kaufman, Historic Heritage Survey: Horseshoe Bend Gold Mining Area, Thomson River, Victoria, Report prepared for West Gippsland Catchment Management Authority, 5 October 2010. If any Aboriginal cultural heritage is discovered or exposed at any time it is necessary to immediately contact Aboriginal Victoria to ascertain requirements under the Aboriginal Heritage Act 2006. Ground disturbance may affect the archaeological significance of the place and, subject to the exemptions stated in this document, requires a permit. Land: All of the land identified in Diagram 1990 is of primary cultural heritage significance. The Thomson River Diversion Tunnel Site is a place of co-existing environmental and cultural heritage values. The Thomson River is listed as a Heritage River under Heritage Rivers Act 1992. The management of this place may usefully be guided by the Australian Natural Heritage Charter. The Australian ICOMOS Charter for Places of Cultural Heritage Significance (the Burra Charter) provides guidance on the management of places which can be applied to places of cultural significance including natural, Indigenous and historic places with cultural values. The definition of 'place' under the Burra Charter has a broad scope and includes natural and cultural features. Natural elements of a place may constitute cultural heritage fabric. 5.1 Conservation of a place should identify and take into consideration all aspects of cultural and natural significance without unwarranted emphasis on any one value at the expense of others. 5.2 Relative degrees of cultural significance may lead to different conservation actions at a place.